We recently heard that a man named Alex Quinn from Northern Ireland had received a very special grace through the intercession of Padre Pio. We were able to contact Alex in Belfast and learn more about his remarkable story. In June of 1998 Alex Quinn’s fifteen-year-old son Philip, was sent home from school with a very bad headache. Within hours after coming home, Philip became paralyzed. Alex and his wife Deirdre rushed Philip to the Royal Victoria Hospital in Belfast. They were both terrified that their son was dying. The initial tests that were taken indicated that Philip had a brain tumor. But four days later, after a multitude of tests, Philip was diagnosed with the deadly disease called encephalitis. The virus had attacked the part of Philip’s brain that controlled movement, speech and memory. Alex learned that there was a man in Belfast named Brendan Rogers who possessed a relic of Padre Pio, a bandage that had covered his wounded side. The relic had been given to Brendan by Father Alessio Parente, Padre Pio’s personal secretary. Alex got in touch with Brendan and he kindly agreed to bring the relic to Philip. In the Royal Victoria Hospital, Philip was blessed with the relic of Padre Pio and all who were present prayed for his healing. Weeks went by but sadly there was no improvement in Philip’s condition. Finally, in September, there was a change. When Alex arrived at the hospital to visit his son, Deirdre was in tears. But they were not the usual tears of sadness, they were tears of joy. With great emotion, she told Alex that Philip had spoken a word to her that day. He had said, “mom.” Alex cried too, not only because his heart was filled with renewed hope, but also because it happened to be September 23, Padre Pio’s feast day. From that day forward, Philip slowly began to improve. He would eventually make a complete recovery. September 23 marked a turning point in Alex’s life as well. He had prayed to Padre Pio for his son’s healing and Padre Pio had sent him an unmistakable sign that he had heard his prayers. Alex knew that his life would never be the same. He now felt certain that he had a special calling, a special mission to somehow express his gratitude to Padre Pio. He did not know how he would do so but he was determined to find a way. In 2002, Alex’s wife Deirdre was diagnosed with cancer. The family prayed to Padre Pio for another miracle but on August 15, 2003, on the feast of the Assumption, Deirdre passed away. She was surrounded by her loving family. Alex prayed that he would be able to accept the passing of his dear wife. The night before Deirdre’s funeral, Alex had a vision of his wife. She had a beautiful smile on her face and she was being carried to Heaven by an angel. Alex was at peace, knowing that his wife was now free of pain and was happy in Heaven. Alex clung to his faith in God and found the strength to go on. 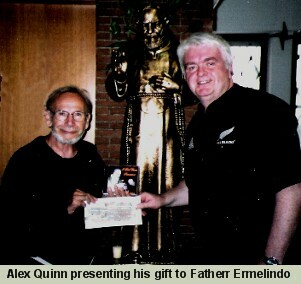 Alex began to regularly attend a Padre Pio prayer group that was held in Belfast. One evening at the prayer group, Father O’Rawe, the spiritual director of the group, said that he would like one of the members of the group to compose a hymn to Padre Pio. As Father O’Rawe said the words, he looked directly at Alex. For many reasons, Alex seemed to be the perfect choice. In addition to his job as a teacher at a primary school in West Belfast, Alex was also a professional musician and a song writer. He wrote the famous song Belfast which had become a big hit throughout the United Kingdom. Alex belonged to a musical group called Barnbrack. The group had been on tour through Ireland, Scotland, England, and Canada and had even sung for the president of Ireland. People everywhere loved listening to the Irish folk ballads that Barnbrack sang. Alex thought that Father O’Rawe had a wonderful idea regarding the hymn to Padre Pio. He decided to do his best to write a hymn in Padre Pio’s honor. He felt that he owed Padre Pio a great debt. Alex was certain that his son’s miraculous recovery was due to Padre Pio’s intercession. 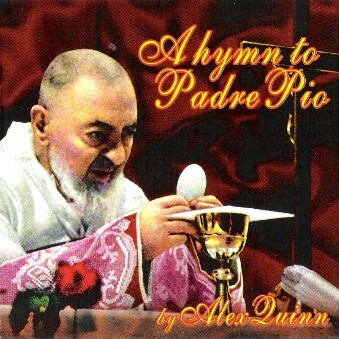 After Alex finished writing the song to Padre Pio, he went to a recording studio to have it professionally mastered. When the song was released, it became very popular in Ireland where devotion to Padre Pio has always been strong. The CD also featured thirteen other hymns including traditional favorites such as Our God Reigns and Be Not Afraid. Soon England and other countries as well were listening to the hymn to Padre Pio and buying the CD. Alex decided to give all of the royalties from the song Hymn to Padre Pio to the monastery of Our Lady of Grace in San Giovanni Rotondo where Padre Pio had lived for more than fifty years. Alex knew that the Capuchins in residence there depended on the generosity of others to carry on their apostolate. Alex planned to go in person to deliver the check. When Alex’s royalties for his song to Padre Pio reached more than 10,000 Euros, he made preparations for his trip to San Giovanni Rotondo. He felt very insecure about traveling alone. In the past, he had always had his wife at his side whenever he went on a trip. One of Alex’s friends was an Italian man. Alex asked him to write a note in Italian explaining that he was traveling to San Giovanni Rotondo. That way, if he got lost or turned around or had any difficulties on the trip, at least he would be able to have the note in hand which explained his destination. Alex’s friend was happy to provide him with the note. When Alex arrived at the airport in Rome, he looked for a taxi to take him to the bus station. It proved to be more difficult than he had imagined. Evidently, Alex’s Irish accent made it almost impossible for the taxi driver to understand him. The taxi driver summoned five other taxi drivers in order to see if they could decipher what Alex was saying. Finally, one seemed to understand and motioned him to get in his taxi. Once at the bus station, Alex had the same difficulty when trying to communicate with the ticket-taker. When he asked for a round trip ticket to San Giovanni Rotondo, the ticket-taker could not understand his “Irish brogue.” Alex repeated his request a number of times but to no avail. He finally had to settle for a one way ticket. When the bus driver made a stop at a convenience store, everyone got off the bus to get something to eat. After Alex had a bite to eat, he stood close to the bus, waiting for the driver to return. By now it had grown dark. He was very tired but he had to stay alert. He estimated that he would get to San Giovanni about midnight. He had made no hotel reservations and he had no idea where he would be staying for the night. As Alex was pondering his immediate situation and trying not to give in to a nagging feeling of anxiety, a stranger approached him. He spoke to Alex in Italian but unfortunately Alex did not understand a single word of what he said. Alex then spoke to the man in English but the man was not able to understand him. Finally, because of the communication problem, the man simply stared at Alex. He was so friendly and engaging that it seemed a shame to Alex that they could not talk to each other. Alex then remembered the note in his wallet. He handed it to the man who read it with interest. Soon everyone got back on the bus. Alex noticed that the kind man who had just spoken to him also boarded the bus. During the journey, Alex observed that the man was constantly on his cell phone, making one call after another. The bus driver made many stops along the way, letting people out at one small town after another. Every time the bus pulled to the side of the road to let people off, Alex would ask the bus driver if they were in San Giovanni Rotondo. He couldn’t relax because he was afraid of missing his stop. When the bus arrived in the town of Foggia, the kind man communicated to Alex by way of hand signals that he was to get off the bus with him. Alex was confused. He was not traveling to Foggia but to San Giovanni Rotondo. But for some reason, Alex trusted the man completely. He did as instructed. They were the only two passengers who got off at the Foggia stop. In Foggia, Alex and his new found friend, boarded another bus. Alex learned that it was the bus that went to San Giovanni Rotondo. Alex couldn’t believe it. He had no idea that he needed to transfer to a second bus in order to reach his destination. If he had not been assisted by the man, who knows where he might have ended up that night. When the bus arrived in San Giovanni Rotondo, the man motioned to Alex to follow him. They walked for about twenty minutes until they arrived at the man’s house. The man then drove Alex to a beautiful hotel. To Alex’s great surprise, it was right next to the monastery of Our Lady of Grace. Alex learned that the man had been using his cell phone on the bus, making one call after another, in order to make a hotel reservation for him. The man went into the hotel and spoke to the manager. Alex was then given one of the finest hotel rooms available. After the man bid him farewell, Alex never saw him again. Unfortunately, he never even got his name. He had been a true “guardian angel” to Alex. At the monastery of Our Lady of Grace, Alex received a warm welcome from the Capuchin community. They were very grateful to accept his generous donation. They were truly happy about the success of his song to Padre Pio. They invited him to eat with them in the monastery refectory, the same refectory where Padre Pio had taken all of his meals. The Capuchins also took Alex to the private chapel where Padre Pio used to say his Mass during the 1930’s when he was segregated from the public. Alex prayed in thanksgiving for the healing of his son. He also prayed for his wife Deirdre. He knew that she was with God now. He had the great consolation of seeing that she was at peace and that she was happy. There would be many more occasions in Alex’s life to give thanks to God for blessings received. He was now able to see that much good had come out of the painful experiences of the past. He would continue to see the hand of God working in miraculous ways in his life. Bill Gleason was getting ready to have shoulder surgery in the winter of 2008. The night before the surgery, Bill decided to go to the rectory at Our Lady of the Rosary parish and ask one of the priests for a blessing. Father Louis Solcia answered the rectory door that evening. He blessed Bill with the holy oil of St. Pio and gave him a prayer card. It had St. Pio’s picture on one side and the novena to the Sacred Heart of Jesus on the other. Bill did not know anything about St. Pio but he was happy to accept the holy card. Father Louis told him to put it in the pocket of his hospital gown and to keep it there during the surgery. Bill was not too concerned about the surgery. It was going to be a routine operation, a rotator cuff repair. Nevertheless, he was going to have to go under general anesthetic and he was glad that Father Solcia had prayed for him. Bill had been praying quite a lot in recent months. Due to budget cuts in the state of California, he had been laid off from his supervisory position at the County Office of Education. Ever since the lay off, he had prayed to God for guidance. “Lord, show me what you want me to do with my life and lead me in the path you have marked out for me,” he frequently prayed. Bill had the shoulder surgery and was to be discharged from the hospital that very afternoon. However, during the surgery, Bill’s breathing became erratic. He had to stay overnight in the hospital and receive breathing treatments throughout the night. Late that evening, his wife Mary Ann called his nurse to see how he was doing. She told the nurse that Bill had a Padre Pio prayer card in the pocket of his hospital gown and she wanted to make sure that he still had it with him. The nurse explained to Mary Ann that Bill had put on a new gown and his other gown had already been sent to the hospital laundry room. The nurse was sorry, but it was too late to recover it. The next morning, Bill was very surprised to see his Padre Pio prayer card in his room. Bill’s nurse told him that she could sense Mary Ann’s disappointment upon learning that the prayer card was gone. The nurse realized that it must have been important. About two o’clock in the morning, she felt a strong urge to go in search of Bill’s holy card. She went to the hospital laundry room and looked through the bins of dirty clothes until she found it. After Bill was released from the hospital, he told Mary Ann that he thought they should start attending the Padre Pio prayer group at Our Lady of the Rosary parish. Neither of them had ever attended it before. He also wanted to make a commitment to pray the novena to the Sacred Heart of Jesus every day. Father Solcia had told him that it was the prayer that Padre Pio had said daily throughout his life. Bill had thought a lot about the fact that his nurse at the hospital had taken it upon herself to search for his Padre Pio prayer card. No one had asked her to do so. Bill was amazed, not only that she went in search of it, but also that she had found it. He felt for certain that the odds were against recovering it. He believed that it was a sign that he should start attending the Padre Pio devotions. Toward the end of the year, Bill began to feel ill. He had chronic pain which seemed to intensify with each passing day. Finally, he was hospitalized. Tests revealed that he had Crohn’s Disease. His condition continued to deteriorate. Further tests were taken which indicated that Bill did not have Crohn’s disease. His illness remained undiagnosed. During his hospital stay, Bill contracted pneumonia as well as the potentially deadly bacterial staph infection called MRSA. His condition became critical. He drifted in and out of consciousness. His breathing became erratic, his heartbeat became irregular, and his blood pressure could not be stabilized. As a last resort, his doctor put him into a medically induced coma. Finally, after Bill had been in a coma for many days, the doctor told Mary Ann that he could offer no hope for her husband. He had done everything that he could for Bill. Bill was dying. The doctor told Mary Ann to take care of any arrangements that she needed to. Mary Ann called Father Solcia and told him the news. He immediately came down to the hospital and gave Bill the Last Rites and the blessing for the dying. To his family’s great relief, Bill did not pass away. He came back to consciousness after being in a coma for eighteen days. He told Mary Ann that while he was in a comatose state, he had a remarkable experience. He found himself in a place of pitch darkness. There he saw the faces of frightful demons. It was truly a place of pain and suffering. An angel came to Bill and tried to lead him out of the dark ravine. “We have to climb the mountain, Bill. We have to go toward the light,” his good angel would say. No matter how hard Bill tried, he was always pulled back down toward the darkness. More than anything in the world, Bill wanted to get to the place of light. At one point, Bill saw a saintly man dressed in robes of pure white. Looking closer, he realized that it was St. Benedict. “Save me!” Bill entreated St. Benedict. St. Benedict pointed toward his right, indicating the way that Bill was to go. Bill went in that direction and soon saw a figure close to him. It was Padre Pio. “Stop right there, Bill,” Padre Pio said, in a voice full of authority. “You must go back. Your work is not finished.” “But what work?” Bill asked. Padre Pio made no reply. Bill knew that the light was up ahead, but he only had a faint glimpse of it. He was never able to reach it. Instead, when he finally opened his eyes, he saw his earthly angel, Mary Ann, at his hospital bedside. How happy his family was to know that Bill had returned to the land of the living! All together, Bill spent a total of seventy-eight days in the hospital. He weighed 223 lbs. when he was admitted and he weighed 139 lbs. on the day he was sent home. Bill’s recovery took many months. His family took expert care of him. They were just glad that he was alive. Bill’s experience in the hospital gave him a whole new perspective on life. Before his illness, he had often attended Mass simply to fulfill his Sunday obligation. Not anymore. Today, he looks forward to going to Mass on Sundays. He knows what a privilege it is. His relationship with God has become much deeper and much more real. He has peace of mind and peace of heart. His faith is stronger now than it has ever been in his life. 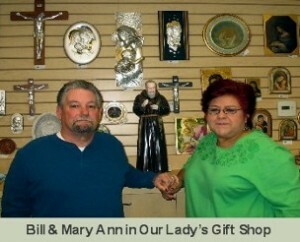 These days, Bill assists Mary Ann in Our Lady’s Catholic Book and Gift Shop on the grounds of Our Lady of the Rosary parish. He sees his work there as a ministry. He always wears a little pin of St. Pio and a medal of St. Benedict. People often ask him about the pin and the medal. It has become an opportunity for him to share his faith with others. He keeps prayer cards of St. Pio with him and often gives them to the customers at the shop. At the Padre Pio prayer group one evening, Father Solcia surprised Bill by asking him to step forward and share his testimony with the prayer group. He was happy to do so. Since that time, many people have asked Bill to relate his story of how Padre Pio helped him in the hospital, after his doctors had informed his family that he had no hope of recovery. A number of people have told Bill that his words have strengthened their faith. Bill feels that he has been given a second chance at life. His family was certain that they were losing him. His own doctor confirmed it. But as our faith teaches us, God always has the final word. Indeed, our lives are in His hands. Bill knows for certain now that he has work left to do. Each new day is a gift from God and an opportunity to share his faith and to serve. Today Bill is alive and well and working in the service the Lord.